This is the first of Neuman's short story collections to be translated into English. A varied collection dealing with the break-down of relationships, the decision to end a life, and making friends with long held enemies, what powerfully strikes the reader is the beauty of this translation. Language springs from the page vitally, and each word finds its place in the story. The title story is wonderfully short, each line adding to the creation of this world in which two lovers constantly make plans that never come to fruition. It is in these private hopes and dreams, these 'hypothetical languages' that the narrator finds something that defines love. Elsewhere in the collection, Neuman teasingly looks at the art of translation itself, viewing it as a chain in which meaning is lost, then rediscovered in 'The Poem-Translating Machine'. What sustains throughout the book is the skill with which the very best short fiction writers are endowed; the ability to twist these amusing stories into something quite dark with the turn of a phrase. In 'Mr President's Hotel' we begin with an obscure message in a hotel guest book and end with a character lurking in our peripheral vision, controlling the President's every move. 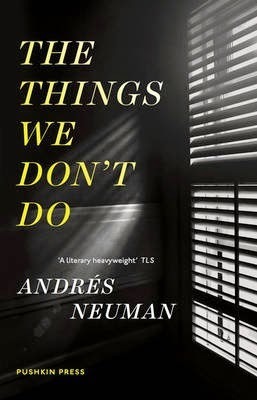 The Things We Don't Do is an entertaining and profound collection which makes the reader consider the world in a new light.